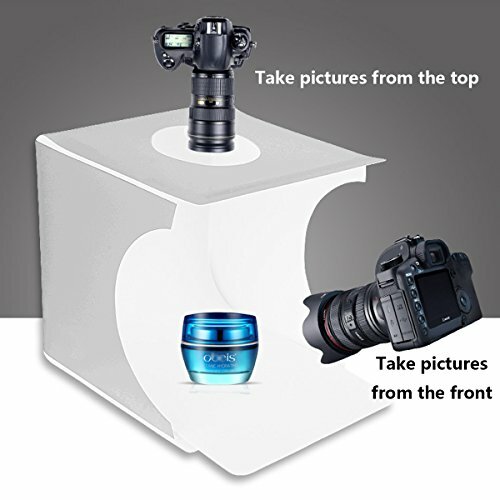 This Portable Photo Studio LED Light Box is specially designed for shutterbugs, artists and online sellers, beginners can also use it to learn to shoot professional photos, Add to your carts to make you own photos now!! Excellent Heat Dissipation Performance:The light bars are made of aluminum plates with an excellent heat dissipation performance. Lighter & Stabler:Made of Soft-light PP material,Light-weight, waterproof, dirt-proof and not easy to wrinkle, can use the wet cloth to clean it; Soft-light PP material, can solve the problems of color interference and environmental light reflection. Portable:It is foldable, equipped with a carrying bag, easy to carry. USB Power Supply:Convenient and fast to use. 【Fast Installation】 All the installation can be finished with only velcro, without complicated installation process. 【High Brightness】 Customized integrated light-bar design with 20 PCS high-quality SMD LED beads provides enough brightness for shooting. 【GUARANTEE】Extended 45-Day Refund Guarantee: Not Satisfied With Our Photo Studio Box? Please Contact Our Customer Service. We Guarantee 90-day No-Hassle Refund! If you have any questions about this product by JHS-TECH, contact us by completing and submitting the form below. If you are looking for a specif part number, please include it with your message.